Last week, BA Interior and Spatial Design students took over the entrance to the RHS Lindley Hall in Victoria with a dramatic installation that welcomed visitors to the first ever RHS London Urban Garden Show. 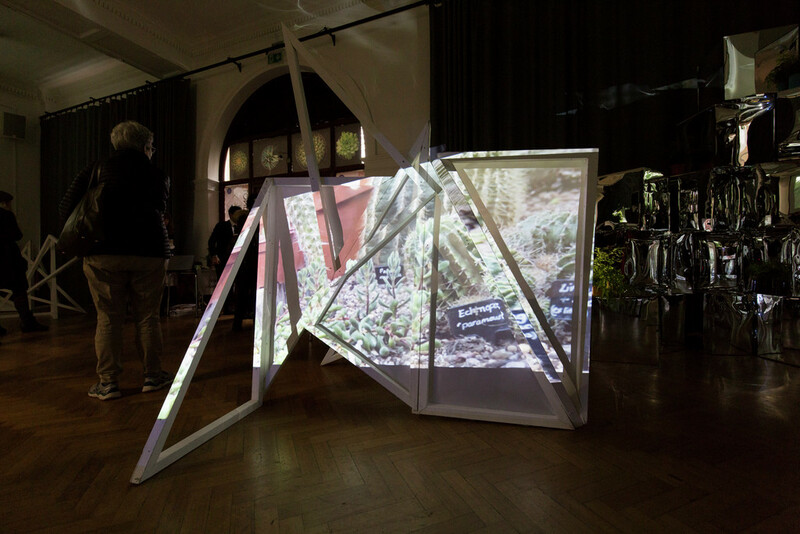 We are in our second year on the BA Interior and Spatial Design course at Chelsea, and this was a great opportunity to take part in a competition to create an installation based on the many aspects of nature. The project was kickstarted when we were asked to create 60 second silent movies about indoor plants and then became quite challenging when, after submitting our cinematic visions, we had to design a screen or installation on which to play our films. Having been divided into groups, we worked together to develop our ideas, taking inspiration from the work of architect, designer and artist Frederick John Kiesler. Our group designed a plan for a pixellated mirrored structure, which was voted through to be part of the RHS Urban Garden Show exhibition. When thinking about the final project, we began by jotting down ideas and playing with different types of modular iterations. From the very beginning we felt it was important to design a visual context where viewers would feel part of the projections and would be able to experience the movies within an enclosed environment, to feel immersed within the videos and creating a multi faceted experience. We took the the shapes and forms of the plants in the films we had made as our starting point, and soon felt that the colors and shapes reminded us of the patterns that you see inside kaleidoscopes. We wanted our viewers to watch images disassemble and reassemble through the surfaces of our structure in a similar way. As we were designing the installation we anticipated that there would be a lot of hands-on making involved, so we knew it was impotent to distribute tasks across the group. Each mirrored box was made by hand: the cardboard base structure had to be individually sealed with tape in order for it to become waterproof. Once that was done, the different squares of mirrors were cut and glued onto the surfaces of the boxes. This definitely took more time than we expected – time management and task management was fundamental to making the project a success.. In June this year we exhibited the structure at Chelsea, to try out our ideas. For this we created 100 boxes which we then doubled for the exhibition at the RHS! BA Interior and Spatial Design students install their work at the RHS Urban Garden Show in November 2016. Image courtesy Martina Bergamo. When we set up our work at the RHS this November, we knew that the installation had be a creative process, which made it difficult to plan in great detail. Arriving on site, we were pleasantly surprised by the way we were immediately accepted as designers and not as students by the RHS team. 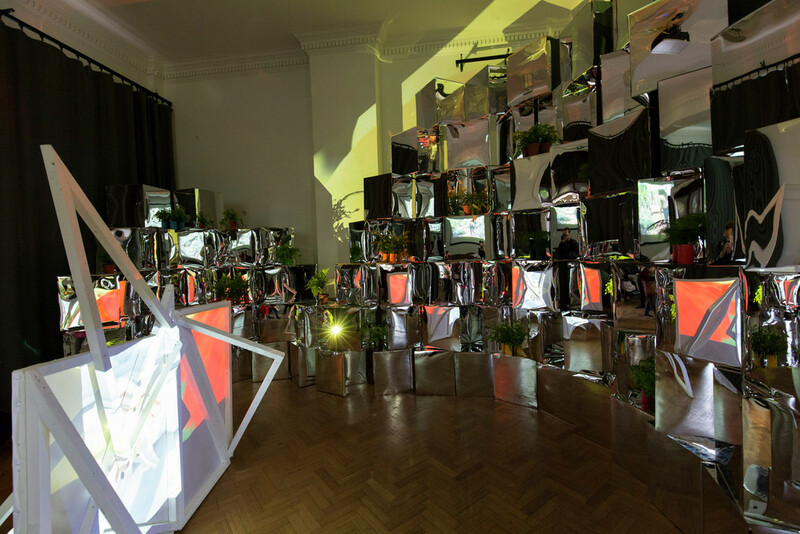 Every member of the group worked together to prepare the boxes and then place them in the space in a multi-faceted kaleidoscopic configuration where they would mirror the projections and merge with the plants we added to the installation on the day. This project has been a fantastic opportunity which has demonstrated the value of working and merging our concepts together as designers, teaching us how to make decisions and how to incorporate virtual installations into a live project. It has been an incredible experience overall: being able to see your designs come to life is extremely satisfying and rewarding. We would like to thank our course leader, Colin Priest for giving us the opportunity to have such formative and incredible experiences and also our tutor Shibboleth Shechter, without whom none of this would have happened. Our classmate Daria Rodionova also took people behind the scenes through a takeover of the Chelsea Instagram.